An air-conditioned sightseeing bus offers a refreshing Charleston Sightseeing Tour for summertime visitors trying to escape the heat or those with limited mobility. Roll by popular "Holy City" sights like Rainbow Row, the Battery, White Point Gardens, Nathaniel Russell House, and St. Michael's Church from wide viewing windows while your guide informs and entertains with stories from Charleston's rich past. Discover top Charleston sights such as Rainbow Row, the Battery, and White Point Gardens with your own professional guide. We thoroughly enjoyed our tour. Josh was a great story teller, mixing history with with both seriousness and fun. We learned so much and hated to see the tour end. 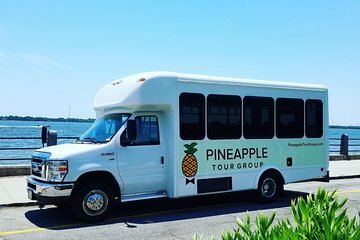 It costs a bit more to use Pineapple Tours, but it is money well spent. Our city tour with Josh was informative and comfortable. Josh's commentary, particularly as related to the slave history of the city, was sensitive and illuminating. We've taken several city tours in the past, but Pineapple Tours was the best. Neil is a great historian. I learned so much about Charleston’s culture and history. I love how Neil incorporated his personal experiences into the lesson. I would definitely recommend taking this tour. We were given an unabashed true history of Charleston. A Charleston native, out guide gave us a more personal spin on Charleston’s history. Thanks and great tour. Really enjoyed the tour. Air conditioning on the bus was very helpful in the late summer afternoon. Guide was informative, humorous and gave us good overview of the city, now we can come back and visit places that interested us during the tour. Guide absolutely loves his city, you can feel it in every story that he tells you, this was so much appreciated. I recommend this tour to everyone.